How do I get past this error in the Firebase console when adding a new app? "There was an unknown error while processing the request. Try again." When google analytics analytics.js in loaded in an iframe (sandboxed) - can it still track all the data from the parent page. Parent page would send data to iframe via postMessage API for data that needs to be sent. In addition to the custom data we send, there are multiple other data google tracks like page title, cookies, device, screen resolution. This needs to be on multiple pages. "There was an unknown error while processing the request. Try again." Firebase: There was an unknown error while processing the request. Try again. I'm not using multiple Google accounts. I've tried signing out and in again, tried changing the package name, and the Firebase status page doesn't show any outages. I've got this query that I'd like to add additional metric of "product details views" this is hits.ecommerceaction.action_type = 2. I understand generally how these queries work, but this one is already complicated for me, and I'm struggling to add these additional nested hits into the mix. This query I have already works to give me landing page and additional dimensions, so all I want to do now is add in product detail views. 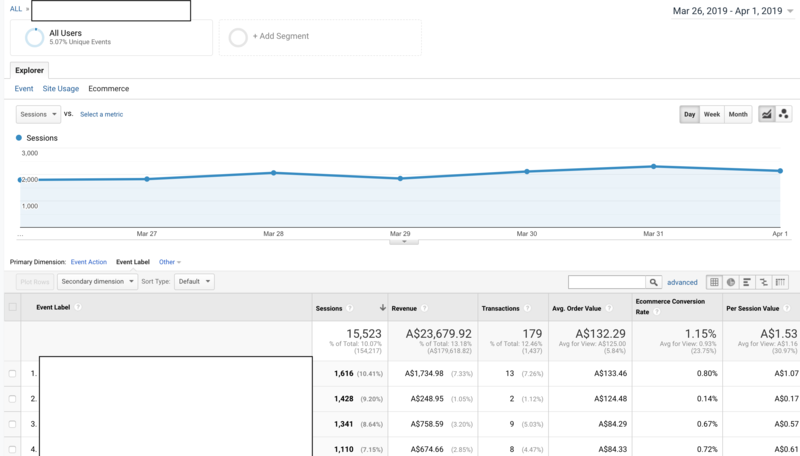 I have a google analytics report in datastudio. One of the pages in the report is attempting to report on events. In GA when looking at the event in the e-commerce explorer tab I will see data for revenue, ecommerce conversion rate, per session value, but in my data studio report all values show as zero. This is a straight google analytics data source (i.e. there is no data blending). Screen shots below of the datastudio result and the analytics report for the data I am trying to match. Every resource I can find says this should be possible and the fact that Google Analytics has the exact same data showing again makes me think this is possible. Is there an issue with what I am doing or the metrics / dimensions I am calling? If not why isn't this working?